I have been analyzing a bunch of doubly polished quartz wafers for FTIR, and now I need to mount them for EPMA. In the past, I have used 1in rounds with holes drilled in them where I put samples and epoxy (see attached photos). The problem was that a lot of the time, the epoxy dried with a semi-concave surface, causing the samples to be tilted, which affected my probe data quality. Most of the time, I cure the epoxy overnight at low temperature in a drying oven before letting it sit for longer at room temperature. I used this method because I always do LA-ICP-MS after EPMA for trace elements, and 1 in rounds work well for both. Does anyone have any suggestions for how to get epoxy to dry flat in this type of sample? Or do you have a better mounting procedure for such tiny, fragile samples that will allow me to do both EPMA and LAICPMS? For mounting on 1" block without any holes you can try using mounting films - either push-n-stick variety, or better yet there are very thin thermally-curable epoxy sheets available for sample mounting. FL901S from Master Bond is only .003" or ~75um thick, providing very uniform flat mounting. Sometimes it could be obtained as "test sample" if you ask nicely and the apps engineer is in helpful state of mind. PBS&T, MEO Engineering Company, Inc.
Another method that might work for you is to simply mount your double polished glass samples on a Si wafer, with only a tiny drop of isopropyl alcohol acting as the "adhesive". I'm not sure quite what is going on as the alcohol capillaries around the sample and dries, but I'm guessing that the alcohol dissolves trace amounts of oils and other hydrocarbons already present, and as it "wicks" around the sample and dries, it makes a surprisingly strong bond. The sample can still removed using a needle gently, but it stays in place for normal handling and EPMA work, I do know from experience. Whether it will stay put for LA-ICPMS is another question, but I'll bet it will. Worth a test I think. Also if the tiny drop of alcohol is placed right in the corner of the sample, it only wicks around the bottom and sides of the sample, and won't ooze over the top edge of the sample, so your sample surface stays uncontaminated, and of course flat and level since the dried residue has essentially no thickness. We've often used this method for mounting micro samples in the lab of all shapes and I think it should work for your flat geological samples as well. Another idea that I might look into is getting 25 mm (1") round Si wafers, so they can mounted right in a standard sample holder without having to glue the Si wafer to an Al puck for mounting in the instrument's sample holder. Here's a company that says they can provide 25mm Si wafers. I'm going to check to see how expensive they are, but on the other hand if we're using the above isopropyl mounting method, the wafers will be re-usable at least. Can you just re-polish after mounting (starting at a higher grade than usual)? IIRC FTIR samples are much thicker than what the microprobe needs. 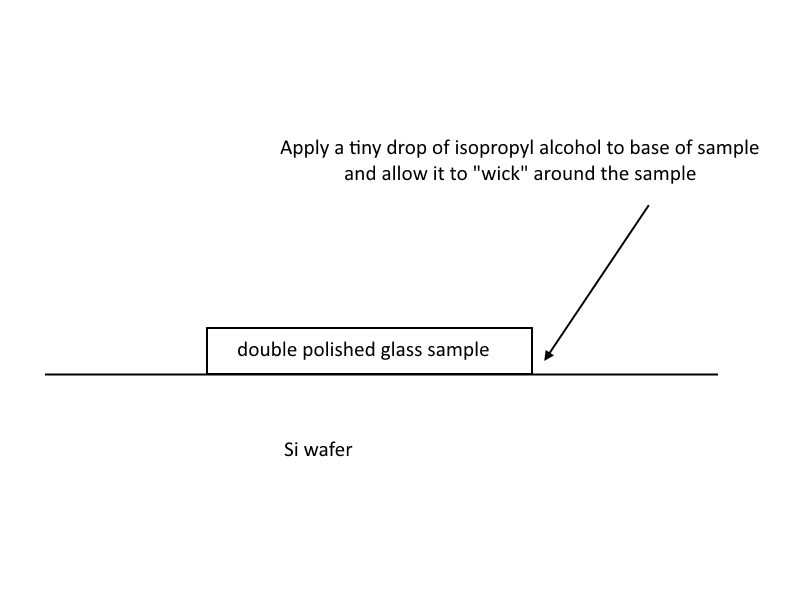 I like the idea of using alcohol on an Si wafer, but I need to be able to remove the carbon coat and be ready for LAICPMS analysis within a few days. I'm not sure that method will work for both EPMA and LAICPMS in short succession. I'll test a few different methods for tweaking my epoxy mounts before making my final sample mounts. Anecdotally, I have seen people just stick their FTIR samples on carbon tape for EPMA and LA-ICP-MS analysis. To create a flat surface for small grains, a highly recommended substrate is Kapton tape. It is relatively easy to get due to its popularity in the electronic industry and 3d printing nowadays. Otherwise, I would also ask why not slightly repolish after mounting as the FTIR sections are likely thicker than what you would need for LA-ICP-MS and EPMA.